Nadine and I were in Monterey over the weekend and while driving somewhere I saw a car going in the opposite direction I did not recognize. Pretty unusual. I pride myself on knowing just about everything about cars (yeah, I do have an ego). But this car, I had no idea what it was; partly because it was gone in a flash and partly because, well it was something I'd never seen before. As I watched it disappear in my rear view mirror I thought the back end looked like a Chrysler Crossfire but it had four doors. This was this past Sunday, March 29, 2009. 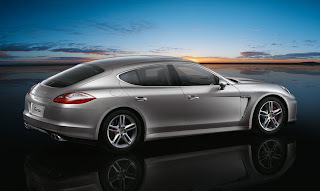 Now it's Wednesday and it hit me - it was the 2010 Porsche Panamera. From what I've learned the vehicle will not go on sale until October 2009, so I don't know if this was a media vehicle or what. Some specs that I've gleaned from other sites are that the entry level Panamer will have a 3.6-liter, 300-hp V6; a "S" model gets a 4.8-liter, 400-hp V8, and the Turbo goes to 500-hp. Prices are expected to start at $89,000 and head up to (or over) $132,600. Information was gathered from various web sites and the official Porsche site. The photo is an official Porsche pic.